And just like that, we have come to the final month of 2018. Many are likely happy to be leaving November behind, though unlike October, which was essentially a straight line down in global markets, November saw some big rallies to the upside while also mixing in more downside sell-off, confounding those who felt they would or could "trade" their way through this. All in, it looks as if the market may actually end November up (it is up a tad at press time, but there is still some time between when I hit "send" and when you get the commentary). November was not defined by a rebound, though - it was defined by big uncertainty around what is in store for markets. Last week was a bloodbath. This week made all that up (again, as of press time). But a 1,000 point down week followed by a 1,000 point up-week are not normal. They do not indicate bad or good - they indicate uncertain, sensitive, volatile, vulnerable. And they indicate a market absorbing a generational question around monetary policy and monetary cycles. Now, if it sounds like that will make for a boring Dividend Cafe, you couldn't be more wrong ... So jump on into this week's Dividend Cafe! Two major categories underlie the tensions that exist in the broad market right now: (1) The uncertainty around the trade war issues with China, and (2) The uncertainty around the impact of Federal Reserve normalization of monetary policy. There is little disagreement that both of these heads exist (as far as headwinds go) - though there are differing opinions about which one trumps the other. My view is that the answer is "both." But we have seen in real time last week and then this week how these forces will end up proving to be a foe to market prices, or they could become a friend. The meaning is simple - if the trade issues show signs of being resolved in a less disruptive manner, markets have reason to breathe a sigh of relief (see this week's Politics & Money section below). Of course, the inverse is equally true - indications of escalation in the trade war increase market volatility, and as I have argued for some time now, they more fundamentally threaten the primary thesis of this expansion - business investment! But let's look at the second foe/friend - the Fed! 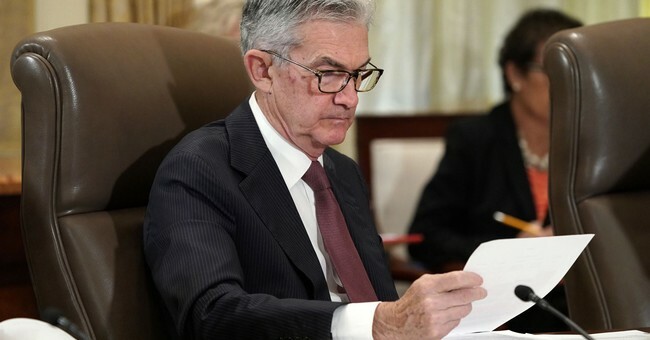 On Wednesday, Fed Chair, Jerome Powell, indicated that interest rates were "just below the broad range of estimates of the level that would be neutral for the economy." Now, "just below" is a subjective term, and there is nothing in his quote or the overall speech (given at the Economic Club of New York on Wednesday) that really assures markets there will be less tightening than markets have feared (and there certainly is nothing that indicates the Fed will not proceed with their planned quarter-point hike in December). In October, Powell said we were "a long way from neutral." This week, he said we were "just below neutral." As far as market prices go, there is your friend and there is your foe. Is there short-term clarity forthcoming on the trade and monetary issues that most impact the present economic recovery? Probably not. But ultimately, many of you are on our plane - where your focus is not (and can not, and should not be) on the short-term market noise and fluctuations, but rather on the fundamental longer-term impacts to economic growth. The 2018 collapse of crypto-currencies is certainly a more significant event than the fact the stock and bond markets appear headed to a roughly flat or perhaps slightly down performance for the year. We know that stock and bond markets have up years, down years, and flat years. But for a new "asset class" (Dear Lord) to get created out of thin air, to have major financial institutions run to the front of the line to cater to this mania, and for a mass of people to enter an "investment" in something that they knew nothing about whatsoever, is (a) Most unfortunate, (b) Not new, and (c) Not going to stop with this mess either. The 80% drop in these crypto-values this year was not systemic (thank God), but it was indicative of a timeless reality of human nature, and that reality is what we work to counter-act each and every day. Courtesy of our friends at Bear Traps Report (Nov. 2018), the following tends to argue for the position we have that corporate credit in our economy has taken on greater risk and lower underlying quality, but is not at a point of catastrophe ... Our debt-to-GDP is at 46% right now in the corporate bond space, but the default rate is at 2.9%. The debt levels were at 45% ten years ago, but defaults were at 13%. In 2002 we were 45% debt-to-GDP, but defaults were 11%. You get the idea. The ratio has pointed to more underlying leverage and a modest deterioration of credit quality, but the fundamental performance has been solid. I will add thanks to my friends at Strategas Research, that while debt-to-EBITDA ratios have been on the rise, debt-to-Enterprise Value is not, and therefore the level of "not ideal" credit conditions is still a mixed bag (at this time). Investment grade credits are becoming more attractive. Overall, there is a total picture that clearly shows 6th/7th inning cycle conditions - not late 9th inning - but not 3rd inning either! You may be expecting me with such a cliché sub-title to say something about "bargain prices" or "better opportunities" that come with the market decline. And mathematically it is certainly true that I believe this market decline really does mean good things for investors who understand the economics of long-term returns (dips like this with new purchases or reinvested dividends are how compounding is given fresh juice over time). But no, that is not the angle I am taking here. What I will say about periods where over-priced froth like the "FANG" stocks drop 30%+ in a month or so is that it forces investors to remember the reality of price and valuation. And what I will say when markets correct 10% in a month is that it forces investors to appreciate asset allocation and diversification, concepts that just one month ago I was reiterating as concepts that "must mean something is under-performing." For investors who have maintained the discipline of well-constructed alternatives in their portfolio are much happier today, as are investors who had exposure to fixed income, and varying types of equities, etc. But more than anything else, it is my hope that periods like this re-establish the premium on advice, on counsel, on communication, on the actual care and work a financial advisor ought to provide. I know how many of those in my industry rely on advancing markets to make up for their service, advice, competence, and counsel deficits. These are the times the bright side of real advisory work are exhibited, in my humble opinion. By the time you are reading this the G-20 Summit in Buenos Aires will have begun, and over the weekend, the hugely anticipated meeting with President and China's President, Xi Jinping. I think it is helpful to think about the potential outcomes from the meeting like this: The really good (not likely), the really bad (not likely), and the "somewhat good" (very likely). Now, before I flesh this out, understand that both of the "not likely" scenarios are absolutely possible. And understand that the very likely outcome has a number of degrees associated with it that could turn things up or down. The "really good" scenario is some form of a big deal coming with China - one that opens new markets, freezes or lowers tariffs, and presents big progress around the possibility of an intellectual property deal. The much more likely scenario is that no substantive terms are struck or discussed, but both sides coming out speaking to progress and further conversation. Something that speaks to some positivity will still be received well by the markets, I would imagine, but in this most likely scenario there is not necessarily meat on the bone around everything. And then finally, the really bad scenario is that there is no progress made or indicated, and the tariff threats hanging over their head right now are enacted, with escalating rhetoric and bad blood around the prospects for a good deal. With up and down volatility like the market has seen the last two months, the temptation exists to believe one can time their way in and out of it.That temptation comes either from the emotional realities of human nature, or the intellectual ignorance around how it generally plays out. The latter can be addressed with data and evidence, such as this week's Chart of the Week. The former, though, requires a never-ending ongoing modification of behavior. And to that end, we work. "The price of education is paid only once. The cost of ignorance must be paid forever."